Okay, hello again. This may be the ride you’ve been waiting for all year. If you have thought of joining us and weren’t sure about the pace or the distance, then, this Saturday’s ride will answer all your questions. It will be short and relatively easy plus we’ll stop for breakfast. Now, that’s a rarity. Plus, the route is both a little familiar and a bit off the beaten track (for us). Still, it is paved, with some rollers but nothing super hard or long. 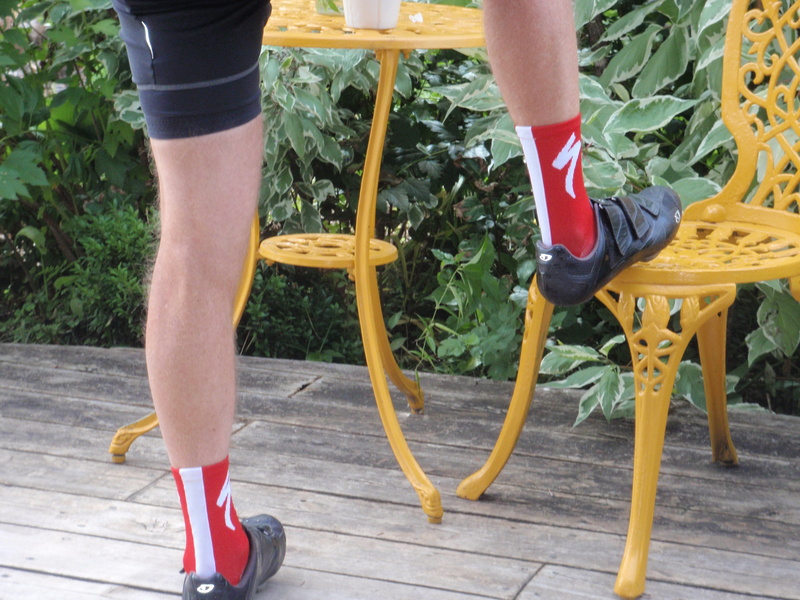 Plus, there will be a special photo taken of the best looking cycling socks. You’ve known deep down (let’s be honest) that it’s not all about the ride. It’s about aesthetics as well as athleticism. It’s the simple, elegant minimalism and functional utility; the graceful lines, and understated form that make pedalling a bicycle an ethereal experience. It’s the pinnacle of form and function: unadorned, mechanically efficient, and beautiful. And, that’s even before you put on your socks. Meet at Stinsons at 8am 8am and ride to Cedar Cove Resort for breakfast at 9 am via White Lake Rd to Conc 8 to Waba Rd to Campbell Side Rd to Bellamy to Peneshula; home via White Lake (to be decided) for a total distance of approx 50 kms at an easy, conversational pace. We’ll keep the effort moderate to preserve energy and leg freshness for Sunday’s Tour de Bonnechere. Just a reminder, it’s steady as she goes. These are ‘no-drop’ group rides. Weather low twenties and with some humidity; winds west at 8. Come out and enjoy this great cycling weather (it won’t last) on some lovely back roads. This is a coffee, cake, and culture tour. Ride your bike! If you can join us, that would be great. Bonnechere August 16: – details here: http://tourdebonnechere.blogspot.ca/. I’m registered. Are you?